All Marvers by Bearfoot Tools are made of lightweight graphite that will not stick to hot glass. 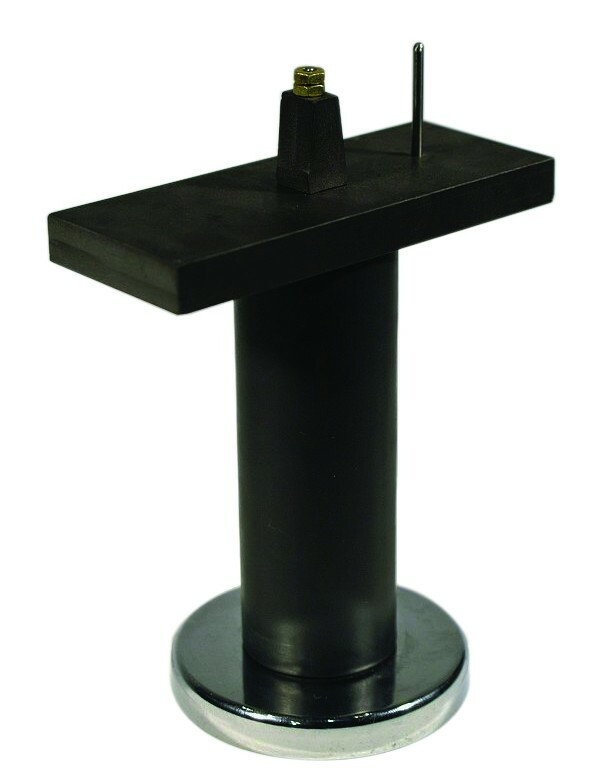 The Pedestal Mounted End Marver measures 5½” tall with a 25lb magnet at the base of the pedestal to provide secure, hands-free marvering while flameworking. The Pedestal Mounted End Marver has a 4 1/2" x 1 3/4" graphic base. This base is fitted in the center with a graphite post that extends 1“ above the base. A tungsten marvering pin in front of the post provides additional marvering possibilities for marvering the sides and end of bead simultaneously for faster wobble correction with reliable results. • 4 1/2" x 1 3/4" Graphite surface with 1" graphite post and tungsten carbide pin for simultaneous marvering of flamework beads. • Graphite plate is positioned at a perfect level for flameworking. • Save time and energy marvering two sides at once.